is like an empty canvas. You can use it to make many unique decorative pieces in a few easy steps. It is also a great project to do with your little ones. 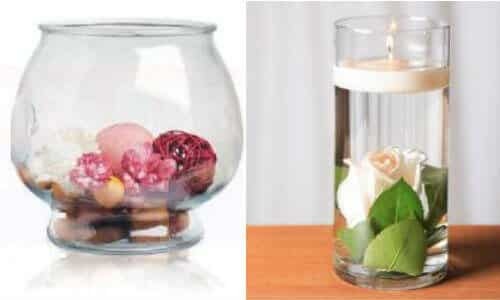 Here are a few ideas that you can use to create decorative pieces from an empty glass fish bowl. You can create a sand art by using different colored sand. Colored sand can either be bought new, or made at home or bought from any thrift store. You can also use sequin or glitter for a couple of layers to give it a sparkly look. You can also add small pebbles, beads as a layer to give the sand art a distinctive look. This makes a wonderful decorative piece in your kid’s room. Another idea to decorate your fish bowl is to use it as center piece. All you need to do is add colorful pebbles, sea glass, shells and sand to the bottom of the bowl. Then fill the bowl with water. You can use different flowers after clipping their stem and make them float in the water. Another option is to place floating candles in it. Light the candles in the bowl and place it as a fantastic centerpiece. and notice how it becomes a conversation starter.